Whether you’re outdoors due to a major disaster or just on a wilderness hike, it’s possible that you’ll run afoul of poisonous plants. If you live in the continental United States, expect to find poison ivy, poison oak, poison sumac, and others in the environment. 350,000 cases of poison ivy alone are recorded in the United States every year. The typical “tri-foliate” appearance of poison ivy and another poisonous plant, poison oak, has led to the saying: “Leaves of three, let it be”. Poison ivy’s leaves appear almond-shaped, while poison oak looks like, well, oak leaves. There are various subtypes: Some are vinelike, others short and shrubby, still others appear as ground cover. There are, of course, plants that are perfectly harmless that come in “leaves of three”. 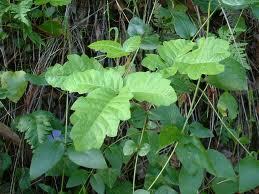 Other poisonous plants, like poison sumac, have a different look. Poison sumac has 7-13 pointy leaflets and can grow into a small tree upwards of 20 feet in height. Poisonwood is a relative that prefers subtropical areas like the Florida Keys. 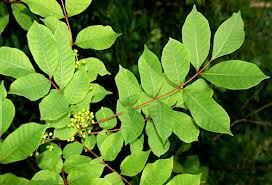 It is thought that inhaling smoke from burning sumac and poisonwood can cause life-threatening respiratory distress. The common factor that makes all of the above plants dangerous is the compound “urushiol”. Urushiol is an oily resin that can be found on just about every part of the plant, including vines, leaves, and roots. The chemical irritant sticks to the skin on contact and causes symptoms in 85% of those exposed. 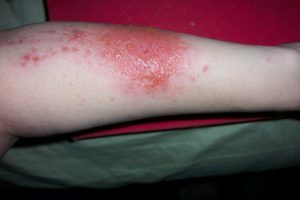 As poison ivy rash is essentially an allergic reaction, it is not, in and of itself, contagious. However, any clothing or body parts that have urushiol on them can cause symptoms when touched by others. As an aside, the presence of urushiol in poison ivy and other plants appears not to be a defense mechanism; instead, it serves to help them retain water. 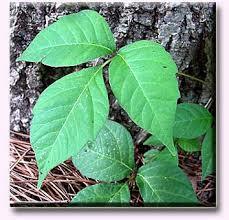 Deer, birds, and other wildlife can eat poison ivy without ill effects. It’s sometimes difficult to make the diagnosis. Most don’t realize they were exposed during their time outdoors. Exposure may also occur indirectly, for example, by petting the fur of a pet that has been outside. The rash might appear in winter and confuse health providers, but even plants that are dormant can cause reactions. Therefore, a red, bumpy, itchy rash in anyone who has been in the Great Outdoors or near others who have (including pets) should raise your suspicions. Either poison oak, ivy, or sumac exist just about everywhere in North America except perhaps mountaintop and desert environments. As such, it should always be on the list of possibilities in wilderness settings. Once you have determined that there has been exposure to poison ivy, it’s important to wash the exposed area and clothing with soap and water as quickly as possible. Urushiol isn’t easy to remove, however, so you might consider soaps that are effective against resins or oil, such as Fels-Naptha or Tecnu. 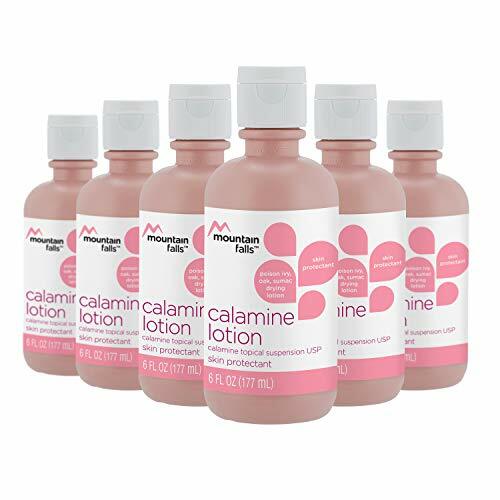 Common treatments for poison ivy, oak, and sumac rashes include hydrocortisone cream, calamine lotion, capsaicin cream, and antihistamines like diphenhydramine (Benadryl). Some recommend the use of rubbing alcohol on the exposed areas. Cool compresses may are thought to be soothing. Epsom salt or oatmeal baths. Aloe Vera gel mixed with various essential oils, such as tea tree, lemon, lavender, peppermint, geranium, and chamomile. 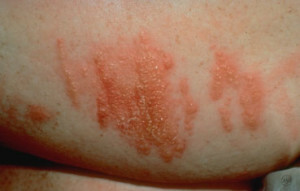 The good news is that, even if you don’t treat the rash, it will go away by itself over 2-3 weeks in most cases. The best prevention is to avoid getting the toxin on your skin. If you can’t avoid exposure, make sure to wear long pants, long-sleeved shirts, work gloves, and boots if you’re doing work in areas known to harbor poison plants. Some recommend an over-the-counter lotion called IvyX as a preventative. Apply it like you would a sunblock to likely areas of exposure. Theoretically, it prevents the oil from being absorbed by your skin. The effects of poison ivy, oak, or sumac can make you miserable and even cause secondary infections, something that will decrease your work efficiency in the Great Outdoors. If you know how to identify these plants and be aware of your surroundings, you’ll have less headaches off the grid. Reprinted with permission from Doom & Bloom. Want To Add Some Music To Your Repertoire?